The developing application "Letters & Words" will help learn to recognize the alphabet letters and compose words in a fun way. 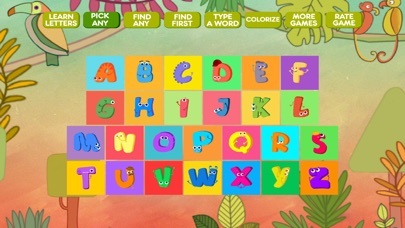 > Interesting game tasks make learning letters from A to Z an exciting game! > Each letter has a bright coloring, which is available within the menu under the button “color the letter”! There are 26 pictures for coloring according to all letters. > Each letter is pronounced clearly and correctly, to form a beautiful speech pattern. > Words from letters can be made easily and intuitively with a feature “Collect a word”. This is an interactive game created with care and love. 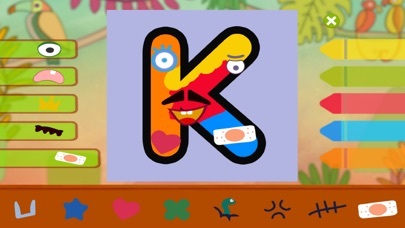 The process of learning letters is fascinating, thanks to a multitude of interactive features, fancy design and pleasant animation. In the cheerful style of letters outlines we can recognize funny animals that will amuse any user. "Letters & Words" will help you learn the alphabet, correct pronunciation and combining letters into simple words in the fun playing way. 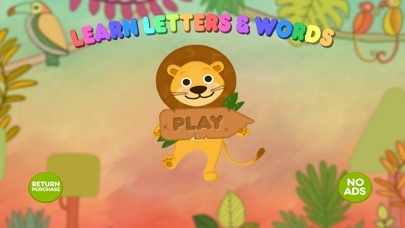 The application “Letters & Words” contains 6 games, each of which develops and entertains in its own way: Learn letters, Pick any letter Find letter Find first letter of a word Type a word Colorize a letter Jolly and unobtrusive music will complement the atmosphere that is comfortable for playing and learning the ABC. 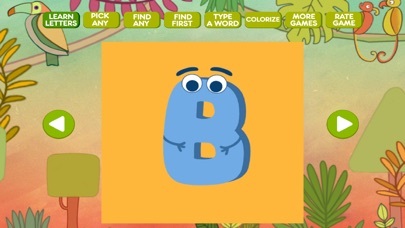 Learn, play and have fun with the interactive alphabet “Letters & Words”!